I was heavily involved with creation of both the Kumeu Arts Centre and the Kumeu Children's Art Club, and I am the current Chairperson of Kumeu Arts and have been for many years. I am a believer in the creative and social development opportunities of the arts for individual and public benefit. As well as being on the committee, I am an active artist, and I am passionate about many varied media including: ceramics, painting, writing, knitting, crochet and much more. I was born into a family of artists and photographers and art has always been integral to me. I originally come from London where I attained my B.A in art and design. My desire to paint and draw the world around me led me to travel extensively and after visiting New Zealand with my wife we decided to move here. I find this country hugely inspiring and feel that it is a lovely environment to raise my two girls. I have taught art in a variety of places; an Indian orphanage, Auckland secondary schools and our very own Kumeu arts Centre. I place huge value on arts education. I am also a practicing artist and have exhibited in a range of galleries in the U.K and New Zealand. I am thrilled to be the current coordinator of Kumeu Arts Centre. This is a dream position for me. My aim is to serve the community, help to facilitate the wonderful resources on offer here and move the Centre forward into exciting new directions. My role here is to curate the gallery and book exhibitions, look after the retail area, organize the classes and events held here and oversee the every-day running of the space. Feel free to write or come in and talk to me about how I can help Kumeu Arts Centre serve your needs. I have been involved with the Arts Centre for over 12 years. I joined the committee initially to be around like minded artists. I had not long moved from England and was feeling very isolated. Many of the 12 years have been focused on getting the building to an acceptable level where it can be utilised as a community art centre. It feels like a lifetime of challenges but when I stand back and look how far we have come it has all been so worth it. I now tutor 5 classes at the art centre, which includes Access to Art and classes for adults with special needs. In my spare time I continue my journey as a practicing artist. This is a dream job for me and couldn't have happened without all the hard work that the committee has put into the place. The art centre has also become my family. There is an amazing group of strong and driven men and women that live their lives as artists. I feel honoured to know that I belong to that group, and am grateful for their ongoing support. 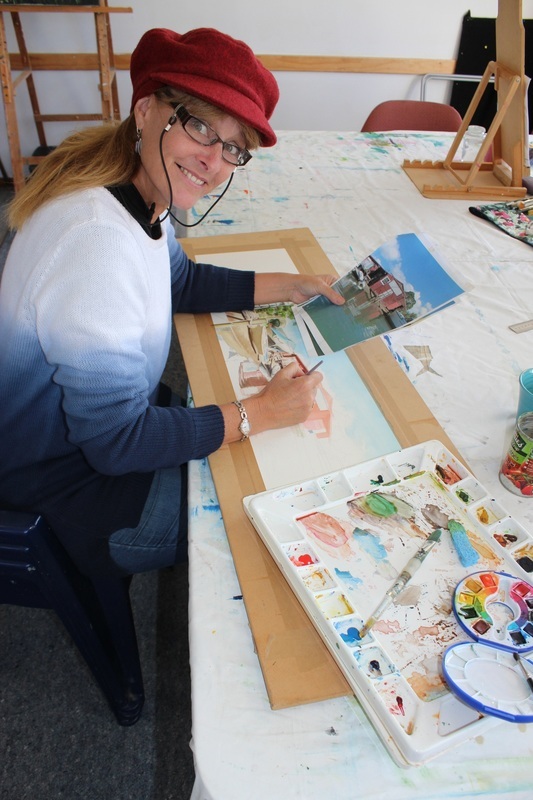 I have been teaching at Kumeu Art Centre since 2012. I have found a haven of like minded and supportive friends and an ever improving building. My style of teaching in hands on. Everyone comes with his or her own project and whether they are complete novice or experienced painters get help individually. I work my way around the students one by one helping them with their individual journey whether it is in watercolour, acrylic or oils. I can advise or show how to improve on technique, colours, use of brushes, and order of process, layout and design, etc and onto selling. There are around 8-12 students per class and I have a policy if you pay for 10 consecutive classes and know you will miss some you can make them up in any of my other classes as long as it is in your 10 weeks. The classes are friendly and talkative and I have several students who have been coming to me for years not because they haven’t learnt anything but for the friends and atmosphere and support they find in my classes. My background is a tradesman sign writer (before the computers took over) having had my own business for 10 years till I either had to get all the computer gear to compete or get out so saw it as a chance to GET PAINTING. I am represented by 3 Auckland galleries and do regular exhibitions. I have been published in “New Zealand’s Favorite Artists” twice and have won numerous awards over the years.I was talked into teaching in 1998 and have loved it ever since. I have become great friends with many of my students and value their input into my life as I feel I get as much for them as they do from me. In 2013, having worked and travelled overseas for many years, I was back in New Zealand and struggling to settle and ‘find my place’ again. I popped in to the Kumeu Art Centre for the first time not knowing what an influence it would have on my future way of life. I was a keen amateur photographer but had no idea of any creative abilities I had. Since becoming a member of the centre I have joined the committee, participated in clay, flax weaving, painting and printmaking classes and founded the Kumeu Photography Group. These have all helped to bring out the creative side of me. I can now happily call myself an artist, exhibiting my photography, photomontage and mixed media work regularly at the Art Centre and other arts events. Our photography group gets together for monthly meetings, day trips and photography events, sharing knowledge and developing friendships. The Art Centre has offered wonderful support and encouragement and new friendships with like-minded people. It has been great to be a member of the committee and to see the Art Centre develop and grow along with its participants creative pursuits. I definitely recommend being part of this thriving arts community. I fondly remember a book my Aunt Betty gave me when I was about 8 or 9. It was titled 'How to draw Flowers' and I loved copying the drawings and 'having a go'. I've no idea where it is now and as other hobbies came and went I forgot all about it. Little did I know that some 30+ years later I would be experiencing that joy again, finding delight in painting both the ordinary and the spectacular plants in all their infinite varieties … and remembering that book! I have always loved 'creating', whether it be knitting, card making, painting or making costumes or scenery for my children's school plays, but it was the chance visit to an exhibition of botanical art back in the 90s in London that set me, although unknowingly then, on the path to where I am today. I had just completed a degree in Graphic Design at Middlesex University in North London, where I specialized in Scientific Illustration. So began a career in medical illustration drawing on my knowledge from previous nursing days which would, or so I thought, satisfy me for years to come. However I soon became disillusioned when computer generated illustration started to take over scientific illustration. My watercolour skills were becoming obsolete in the medical field and they needed a new outlet. My first foray into botanical art was when the UK Clematis Society asked me to paint a Clematis of my choice for the cover of their journal. By this time, art was on the back burner as we had 3 young children and I was back on night duty part time, so I was delighted to be asked. However it was in the middle of our UK winter, with great naivety that I rushed to buy a Clematis from the local garden centre! Yes, they did have some, but of course they were just bare twigs, having been pruned weeks before! Somehow I managed to nurse and cajole the poor specimen indoors which eventually obliged by producing a few leaves and eventually a flower! My love of botanical painting was born! Unfortunately, that was it for many years. Family commitments took over, I was still nursing and art was relegated to the back burner with a few hours snatched here and there. We came back to New Zealand 12 years ago (I married a Kiwi) and again art was more or less a hobby. I worked and still do, in a learning support department of a local college and loved helping the students become the best they can be, watching them grow in confidence. I especially love the art related topics, and take delight in seeing them produce art which they can be proud of. I hope to share my passion with you and inspire you to see the delicate beauty and glorious detail of plants around us and successfully transfer that beauty to paper.